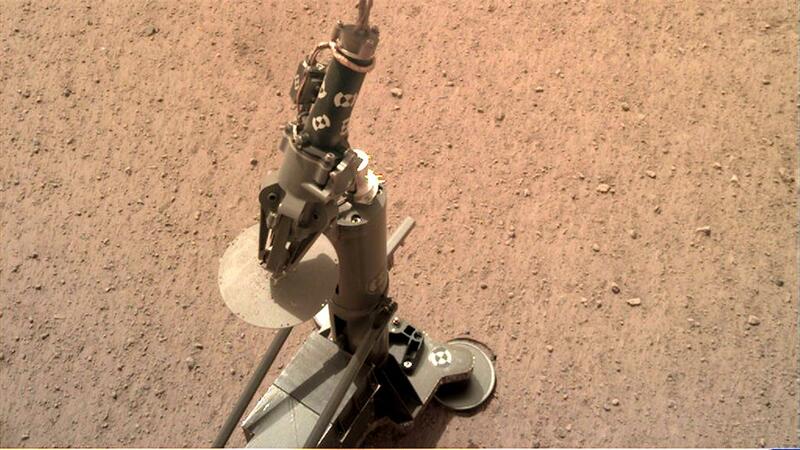 On 12 February 2019, the DLR HP³ experiment was deployed on Mars by the robotic arm of the NASA InSight lander. The HP³ experiment is now situated about one metre to the left of the SEIS seismometer. 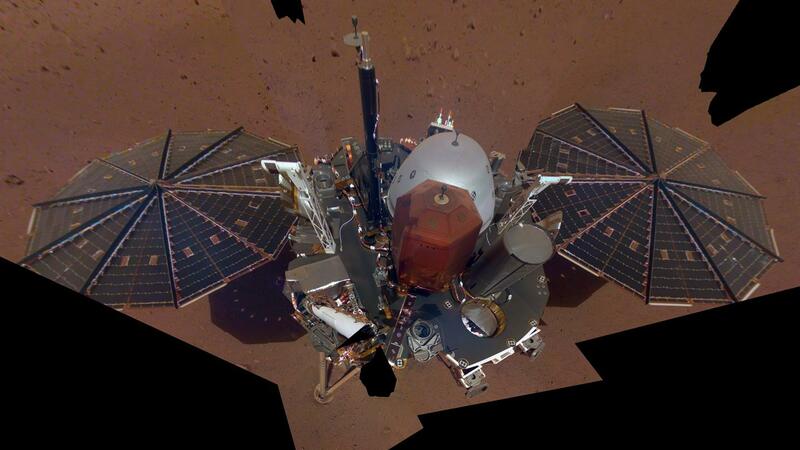 Both experiments were set down on Mars by the robotic arm of the NASA InSight lander. 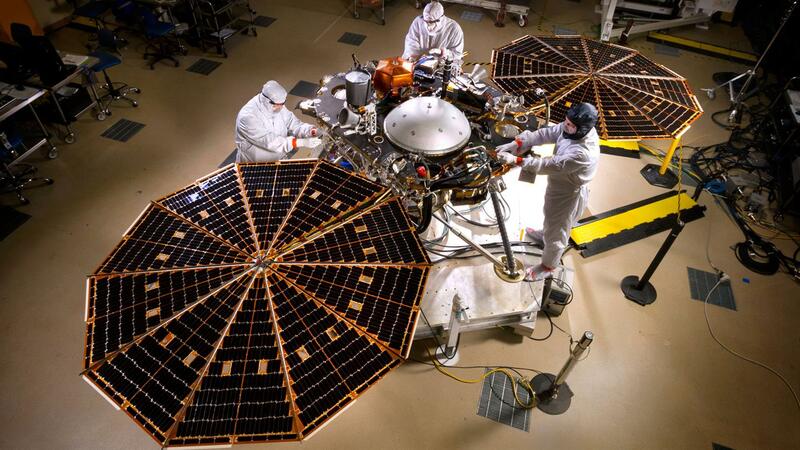 The InSight mission is being conducted by the Jet Propulsion Laboratory (JPL) in Pasadena, California, on behalf of NASA's Science Mission Directorate. 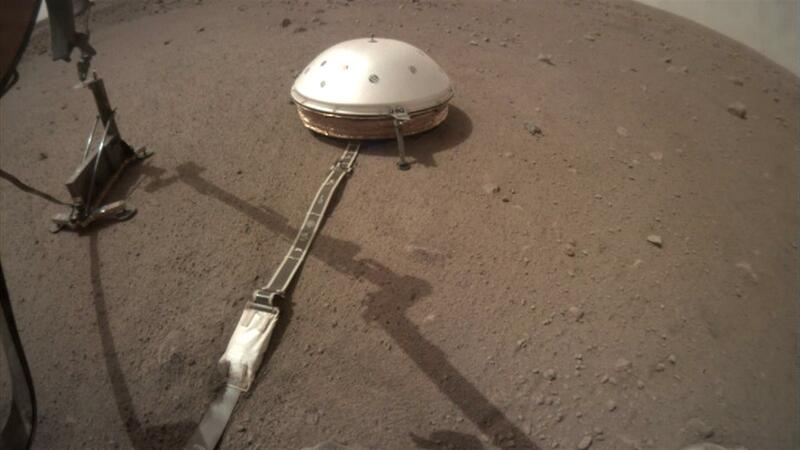 InSight is part of NASA's Discovery Program. DLR contributed the HP³ experiment to the mission. Scientific leadership lies with the DLR Institute of Planetary Research, which was also in charge of developing the experiment in collaboration with the DLR institutes of Space Systems, Optical Sensor Systems, Space Operations and Astronaut Training, Composite Structures and Adaptive Systems, System Dynamics and Control, as well as the Institute of Robotics and Mechatronics. 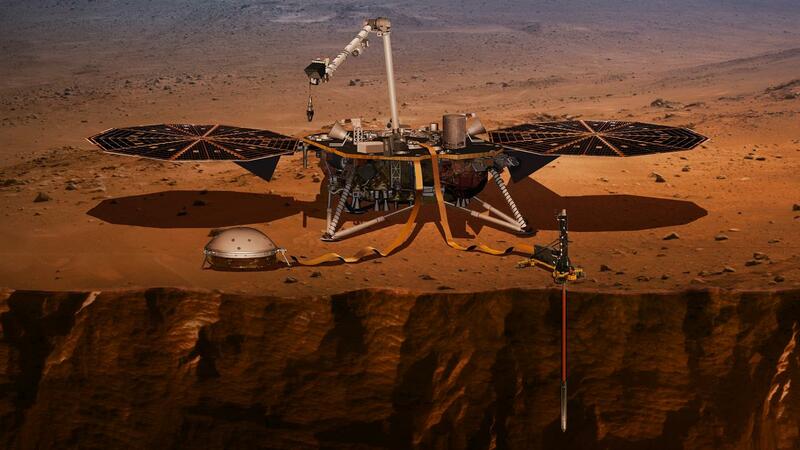 InSight’s structural design is similar to that of NASA’s Phoenix lander from 2008. The main component is a platform two metres in diameter, on which most of the system components – the experiments in their ‘transport mode’, the antennas, the on-board computer, the thrusters, the propellant tanks and three telescopic legs are attached. 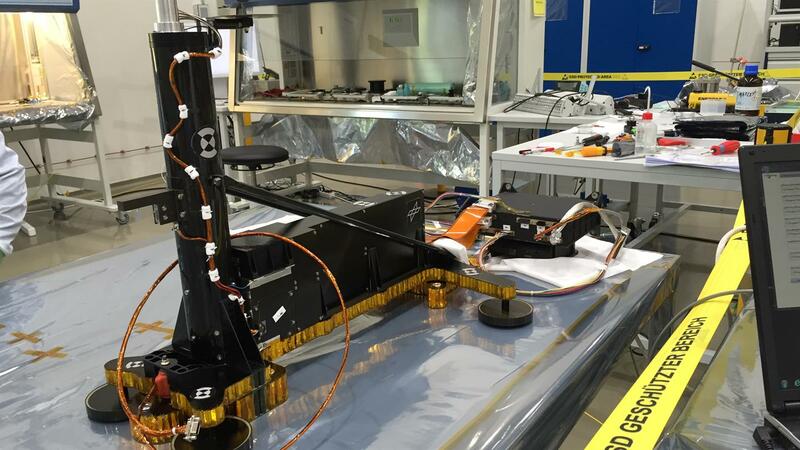 A robotic arm will be deployed after landing and lift the experiments HP3 and SEIS from the platform onto the Martian surface. At the side of the platform are two solar panels, which produce a maximum of 700 watts, depending on the distance between Mars and the Sun. The RISE experiment is conducted from the platform itself. It stands vertically on flat ground, ready for its historic mission. 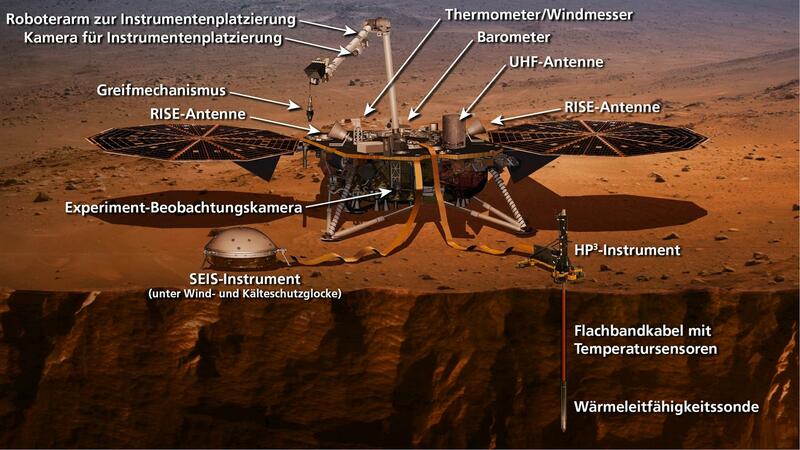 At 19:18 CET on 12 February 2019, the German Aerospace Center (Deutsches Zentrum für Luft- und Raumfahrt; DLR) Heat Flow and Physical Properties Package (HP³) or 'Mole' was deployed on the Martian surface using the NASA InSight mission's robotic arm. 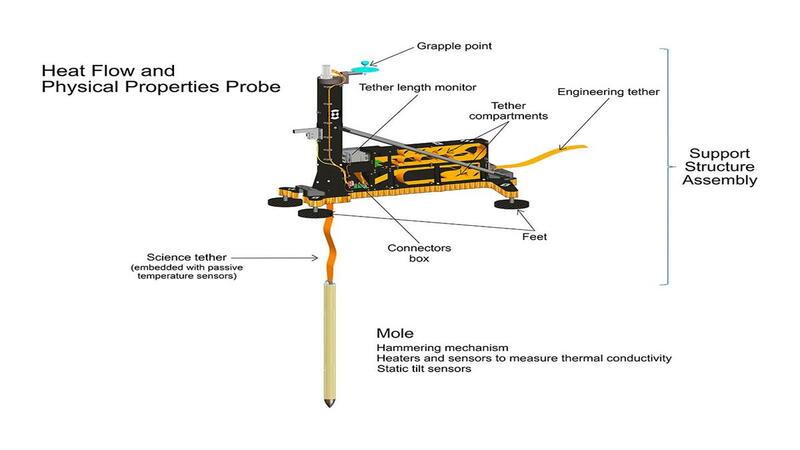 In the coming weeks, the remote controlled penetrometer is expected to make space history by becoming the first probe to reach a depth of up to five metres in the Martian subsurface. Its goal is to measure the temperature and thermal conductivity of the subsurface and thus determine the heat flow from the interior of Mars. The heat flow gives researchers indications about the thermal activity of the Red Planet. This can provide insights into the evolution of the Martian interior, whether it still has a hot liquid core, and what makes Earth so special in comparison. Detailed information on the InSight mission and the HP³ experiment can be found on DLR's dedicated mission site, with extensive background articles and the mission brochure. For mission updates, follow the hashtag #MarsMaulwurf on the DLR Twitter feed. Principal Investigator Tilman Spohn reports on the status of the mission in a blog.